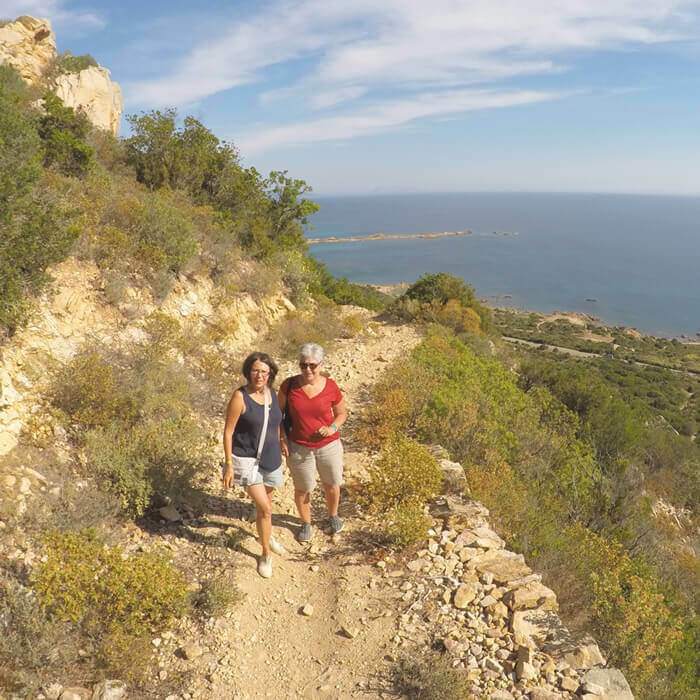 Immerse yourself in the Capo Comino natural reserve hopping from scenic hiking trails to white beaches with pristine waters. 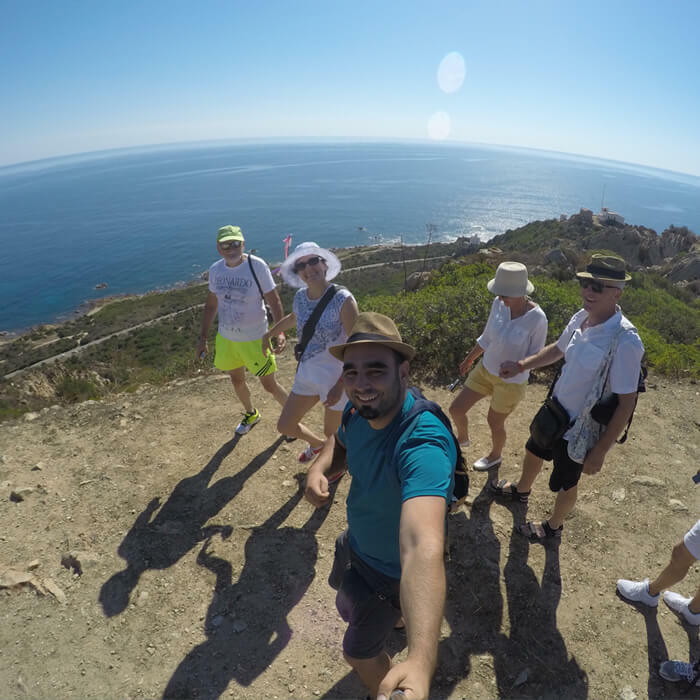 Half a day unique experience that allows you to explore the most beautiful wild sites of the Capo Comino area from both land and sea point of views. Small groups only 6 max 12 participants. We leave the meeting point in La Caletta, heading to Capo Comino, the most eastern part of Sardinia from where your adventure begins. We will hike for half an hour in the mediterranean bush full of aromatic herbs such as rosemary, cistus incanus, cork trees and mirto, heading to the peak of Punta Artora, from where we will enjoy an amazing view on the east coast of Sardinia. 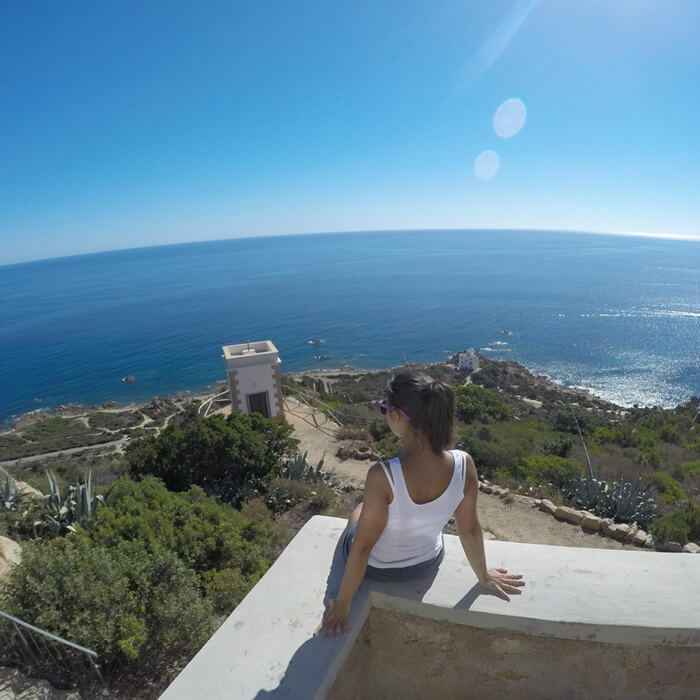 Our hike will bring us to the old Capo Comino lighthouse where we can enjoy the peaceful environment with a magnificent view on the landscape and the infinite sea. As we climb a bit more we’ll be able to see the snow white sand dunes of Capo Comino, a place where you would love to stay forever. We start hiking down back to the old lighthouse where we will stop for a light lunch based on local traditional Sardinian food products, before moving to the pier of Capo Comino where the snorkeling adventure begins. At the pier we will meet Maurizio, a diving guide, who will be your snorkeling guide, showing you the hidden treasures under and above the waters of Capo Comino. You will see ancient anchors, and the Red Island. The tour ends with a return to La Caletta by boat, not before taking some pictures of the small fisherman village of Santa Lucia. 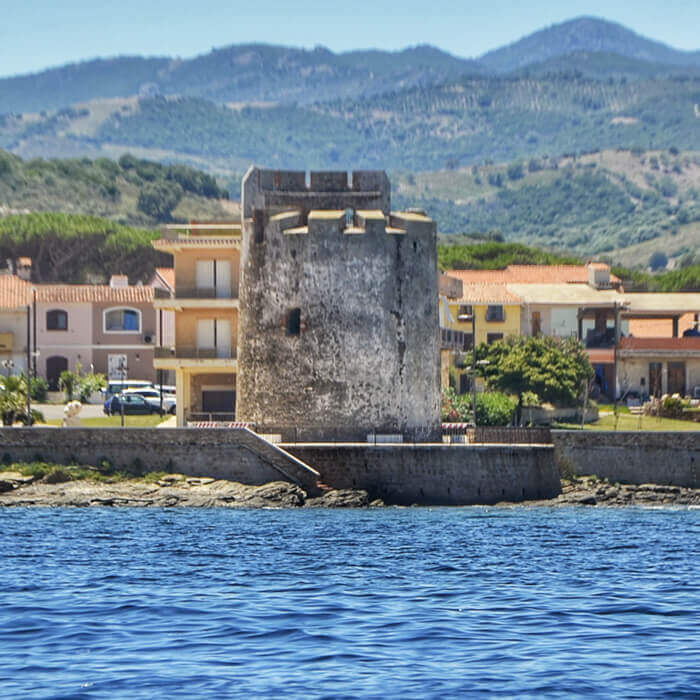 A must to do experience for those who spend their holidays in Siniscola. 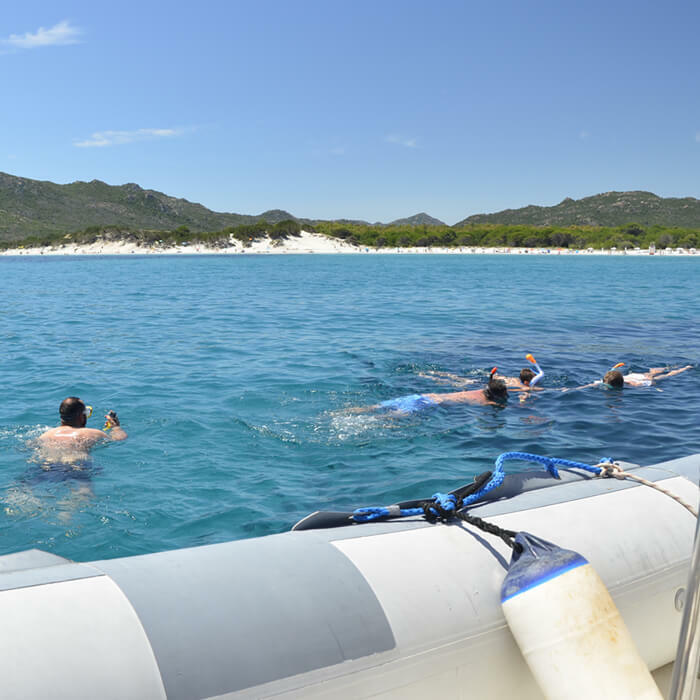 Tour highlights: Punta Artora, Capo Comino, old lighthouse, boat trip, Capo Comino snorkeling, Red Island, Santa Lucia, typical Sardinian food and wine tasting. Tour duration: 4h30m (8.30AM-1PM) including van transportation. Suggestions for this tour: Wear good hiking shoes (no open shoes, sandals or flip-flops) and comfortable clothes for the hike, and bring your beachwear and beach towel for the second part of the tour. Bring also one bottle of 1.5 lts. drinking water per person, and sun protection. We loved taking Giulia on a snorkeling and hiking tour in Capo Comino and Berchida! 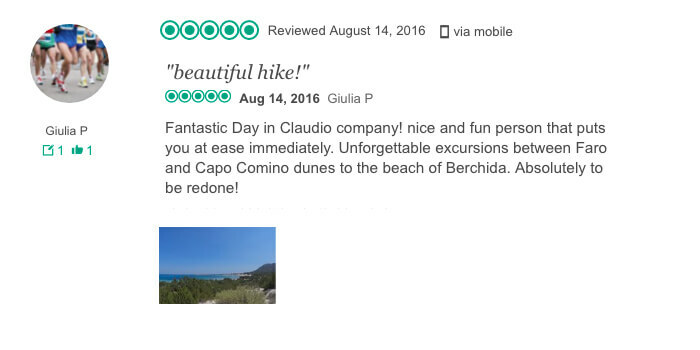 Read what she says on her great review on Tripadvisor about her Sardinian Slow Experience with our Capo Comino Hike + Snorkel Tour.